One of North America's largest renewable energy companies, SunEdison, filed for bankruptcy last month, with debts totaling roughly $16.1 billion. The company's demise -- it once attracted the interest of major hedge funds, such as David Einhorn's Greenlight Capital, Daniel Loeb's Third Point Management, and Larry Robbins' Glenview Management -- represents yet another dramatic failure in the solar industry. The company's fall from grace also casts severe doubts on two of its spin-off companies: Terraform Power (NASDAQ: TERP) and Terraform Global (NASDAQ: GLBL). These sister companies allowed SunEdison to acquire solar and wind assets at a lower cost of capital. Because they shared interests in similar projects, the companies were disproportionately reliant on each other's success. Now that SunEdison has declared bankruptcy, what does the future hold for Terraform Power and Terraform Global? To understand the impact SunEdison's bankruptcy will have on Terraform Power and Terraform Global, we must understand why the companies exist in the first place. SunEdison was originally a silicon-wafer manufacturer, established in 1959 as the Monsanto Electronic Materials Company. In 1989, Monsanto sold the company, and for decades it was known as MEMC. In 2009, however, the company began a major shift in business strategy, transitioning from a panel manufacturer to a developer of solar projects, marking its push into independent renewable power generation. With its solar project backlog starting to grow, SunEdison was looking for ways to raise increasing amounts of capital at attractive rates, a problem that other solar companies have faced, including SolarCity. So, in 2014 and 2015, the company spun-off two companies known as "yieldcos": TerraForm Power and TerraForm Global. At the time, yieldcos were a fairly novel approach to raising billions in asset-backed financing. The chief purpose of a yieldco is to lower borrowing costs, making projects more attractive compared to those of peers. Yieldcos lower costs in two ways. First, they bundle renewable, contracted operating assets in order to generate predictable cash flows. By bundling the contracted assets that SunEdison builds, the yieldcos can sell debt at cheaper rates than a single project. Second, they are structured to simulate the avoided double-taxation benefit of MLPs and REITs, allowing them to pass untaxed earnings through to investors. The biggest problem facing Terraform Power and Terraform Global is that both companies anticipated recieving a consistent, long-term stream of projects to bundle from SunEdison. 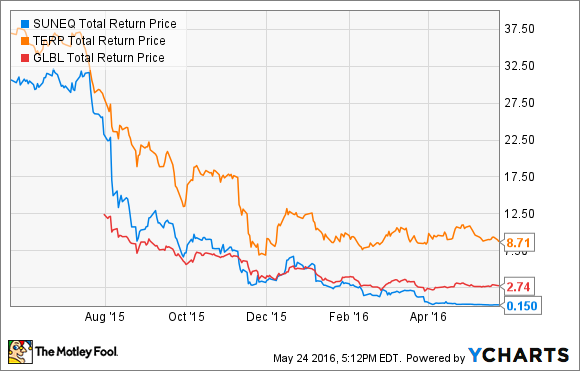 With SunEdison's insolvency, the future pipeline of projects is heavily in doubt. According to both companies' latest investor presentation, they will need to "plan for stand-alone capability." Importantly, however, each company still owns solar and wind developments, which still have long-term, contracted value even if SunEdison disappears. Both have persistently said that they have "no plans to file for bankruptcy themselves," and the equity interests in their wind and solar power plants are not available to satisfy claims from creditors of SunEdison. Even if they never received another contract, both companies have projects across the globe, with predictable cash flow streams lasting up to 20 years or longer. Image source: Terraform corporate presentation. Projecting the yieldco's future is incredibly difficult given virtually no clarity on future growth projects. Additionally, without SunEdison's reliable project-sourcing, borrowing costs are rising. For example, Terraform Power just issued debt at an adjustable interest rate of 6.5% or more, significantly higher than the 4% it received in 2015. Sourcing new projects and keeping debt costs low are the two most important factors for both Terraform Power and Terraform Global. With no visibility on either of those items, an investment decision is all but impossible.